DaqMusiq is a new way to make music using your Windows sound card... and it's also a way to make a new kind of music. DaqMusiq (and KaleidoSynth) allow you to explore musical frontiers, the borderlands between order and chaos that comprise music. You may be surprised at just how little order is needed to transform mayhem into music... and best of all, you don't need musical training to do it! The above image is from a DaqMusiq performance of an included MIDI setup called GlossyFishSticks, which acts as a real-time composer and performer. It uses pseudo-random values that start from an initial truly-random "seed" value, one of over 4 billion possible. Once started, the performance will not repeat for many billions of years. However, by setting the same seed you can repeat any performance exactly. In the example shown, the particular seed gives rise to a performance we have named "Mountain Heather". The colored horizontal lines show the notes being played, color-coded according to tonal instrument as shown, on the black-and-grey vertical piano keyboard of Daqarta's Pitch Tracker. 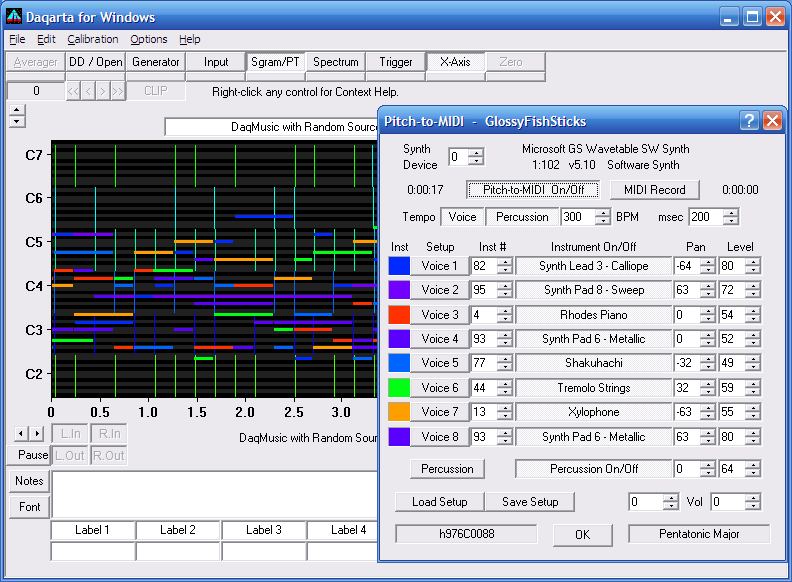 The vertical lines show percussion hits, color-coded according to percussion instrument (in the Percussion dialog, not shown). In general, DaqMusiq uses the Pitch Tracker to extract the instantaneous pitch of a signal or an internal random source, and Pitch-to-MIDI to convert it to MIDI sound... usually with plenty of modifications from the raw extracted pitch. Daqarta's Pitch-to-MIDI system consists of 8 separate tonal voices, plus percussion, each with multiple parameters you can preset manually or control via individual Changes scripts that run concurrently in real-time. Everything is saved in MIDI setups (.DQM files) that you can load and run at any time. Although musicians can use this system to compose "traditional" music, or to create real-time "algorithmic" compositions, or even to perform pitch-tracked accompaniments of conventional instruments, here we will discuss endless, ever-changing music that is based on random or pseudo-random values... DaqMusiq. You can play DaqMusiq like you play a CD recording, and just listen. Daqarta includes a number of MIDI setups that you can just play as-is; each time you listen, you will hear something different. And as long as you listen, you will keep hearing something different. But DaqMusiq is really made for tinkering and exploring. You can take an active part in shaping performances by setting controls and changing scripts, or writing your own scripts from scratch. You don't really have to know anything about music to do this; you can just fool around with "what if I do this" scenarios, and see what happens. In fact, "just fooling around" is a great way to learn... it's really fun, and quite a thrill when you make a new discovery. KaleidoSynth is the audio equivalent of a kaleidoscope. The Pitch Tracker determines the input note pitch, but the Pitch-to-MIDI converter is set up to convert it to an instrument sound at a different note... which goes around again and again, changing each time. Setting the nature and amount of difference allows for a huge variety of "performances", from peaceful background music to edgy jazz. And careful selection of the Track threshold and frequency range allows audience interaction! After download and installation , start Daqarta and wait for the "logoship" animation to complete. A message will pop up listing hot-keys for included mini-apps and macros. Hit the 'F8' key, then 'D' (shifted or unshifted), to start DaqMusiq. A standard Windows File Open dialog will show all DaqMusiq (.DQM) files. Hit Escape (or click Cancel or [x]) to start the default GlossyFishSticks.DQM (see below). A typical DaqMusiq or KaleidoSynth performance continues indefinitely, often with a characteristic style but never exactly repeating. You start with a general instrument setup, then use a Changes script to shape the performance: Create and explore musical themes, build excitement, add variety... it's up to you. The following are conventional MIDI (.MID) recordings that you can play from your browser, using your default music player. Each was created using the MIDI Record option in Daqarta's Pitch-to-MIDI dialog to capture a short section (about 30-60 seconds) from a performance of the indicated Daqarta MIDI setup (.DQM file). An actual performance from within Daqarta goes on for as long as you want, continually changing. All recordings are DaqMusiq, except as noted where a KaleidoSynth version is included for comparison. A link to a discussion of each .DQM setup is provided, which covers relevant Pitch Tracker and Pitch-to-MIDI control setting and shows all Changes scripts. Caution: These examples are intended to be played over speakers. They include dynamic panning that can sometimes be disconcerting over headphones. Acoustic Grand Piano and Tremolo Strings in Pentatonic Major scale. Electric Guitar - Jazz and Electric Bass - Pick in Blues Major scale, plus 6 different Percussion instruments with changing patterns. Acoustic Grand Piano on lead and Acoustic Guitar - Nylon on rhythm, both in Blues Major scale, with Side Stick and Acoustic Snare on percussion. Occasional Tremolo Strings background in Pentatonic Major scale. The guitar uses a standard Blues progression. Orchestral Harp in Pentatonic Major scale. English Horn, sounds like chattering or muttering voices. (Comical, not musical.) The KaleidoSynth version has pauses, while the DaqMusiq version is non-stop. During the actual KaleidoSynth performance, you can control the pause tendency by adjusting the output or microphone levels: Softer output or lower sensitivity makes it more likely to pause; higher makes it more non-stop. Timpani in Chromatic scale to produce an intense percussion performance. The KaleidoSynth version has occasional pauses, while the DaqMusiq performance is more "fast and furious". Three voices of Tremolo Strings in Chromatic scale give an "edgy jazz" sound reminiscent of 1960s grade "B" detective movies. The KaleidoSynth version has "dramatic pauses" that could be enhanced during actual performance by decreasing the output level or input sensitivity. Tenor Sax and Electric Bass - Pick in Major scale. JukeBox composes a very simple random melody of random length, and plays it with a random instrument. Then it repeats with an entirely new song and instrument, forever. There are literally billions of "songs" here. 4 are included in the above example; more samples are also available for comparison. These use Daqarta's MIDI multitasking feature to play 8 different JukeBox scripts concurrently. GlossyBlack uses the Pentatonic Major scale (black keys only). GlossyWhite uses Major (white keys only) like the original JukeBox. GlossyBlue uses a Blues Major scale, while GlossyChrome uses Chromatic (all keys). GlossyBlack is usually easy to listen to, lively and cheerful at the default Tempo of 300 BPM. It sounds somewhat like a folk music jam session, while GlossyBlue is more like a jazz or blues jam session. GlossyWhite is also typically pleasant but may have occasional "challenging" passages, while GlossyChrome is unabashedly "New Music". In the live performance, you can optionally choose to have the tempo vary in a smooth semi-random fashion, as the sum of two slow oscillators with non-integral frequencies. Alternatively, you can set it to vary interactively according to mouse position. Another option allows a random tempo selection at the start of the main ( Voice 1) song cycle. Please note that all these setups use very simple approaches. They are intended as demonstrations of the concept... you are encouraged to use them to begin your own explorations. See the JukeBox and Glossy discussions for ideas to get you started. GlossyFish.DQM is similar to the above Glossy setups, except it has Scale control via hot-keys, plus random Level settings and biased random Hold Beats for each voice. In addition, it includes random Note Lags to prevent the "machine music" effect where every instrument is exactly "on the beat". GlossySticks and GlossyBones apply the GlossyFish "jam session" approach to percussion instruments, as well as to percussive tonal instruments like Woodblocks and Timpani. GlossySticks and GlossyBones differ primarily in the way that they handle non-tonal percussion patterns: GlossySticks changes to a completely new random pattern each time it changes to a new random instrument, while GlossyBones "evolves" by changing only one beat of the pattern when the instrument changes. GlossyFishSticks and GlossyFishBones combine the random tonal composition "jam session" approach of GlossyFish with the random percussion patterns of GlossySticks and GlossyBones, respectively. The samples below all use the default Pentatonic Major scale. Live performances with Daqarta allow hot-key scale changes for a different character and "feel" of the music. For convenient reference, these sample performances are given names like "Mountain Heather" instead of referring to them by their random seed numbers like "h976C0088". Although these samples are truncated after the first minute, the live performances continue indefinitely. By default, GlossyFishSticks and GlossyFishBones will play totally new creations every time you toggle Pitch-to-MIDI on. However, you can set the relevant seed number to repeat any performance. The seed lines for the samples below are already included in the relevant Changes scripts, with leading comment semicolons to inactivate them. Just remove the semicolon to hear a specific performance. For GlossyFishSticks those are at the start of its Voice 1 Changes script, while for GlossyFishBones they are in its Percussion script. The above are just the first 60 seconds of performances that will keep changing essentially forever. But GlossyFishSticks and GlossyFishBones have a Theme Pattern Repeat parameter that allows you control the probability that the initial themes will be heard again. The above performances had this parameter set to 0 (no repeat), while the performances below were made with the identical random seeds, but with the repeat parameter at 12 (always repeat). GlossyTracks is derived from GlossyFishSticks, above, but instead of a single never-ending performance on each start, it has over 4 billion unique "tracks". The default duration of each track is approximately 1 minute, after which the performance fades to silence, then restarts with a completely new track. You can easily change the track duration as well as the fade time and dead time between tracks. Each track uses a random Scale, selected from a list of preferred scales in a text file that you can edit. This gives each track a different "feel". In addition, each track has a random tempo within a default range of 200-300 BPM. The random tempos can be evenly distributed throughout the range, or can be biased to have more fast, slow, or mid-range tempos using different non-uniform random distributions. A mid-range bias is used by default. As with the other Glossy setups, GlossyTracks shows the random seed it has chosen. When you hear a track you like, you can copy that seed and paste it into the start of the Percussion script to force the first track to that value. Subsequent tracks will follow just as in the original performance, each with its own seed. You can change the default Seed , Time (duration), BPM range, Note range, Pattern length range, and Pattern Repeat threshold by entering appropriate values in the main Daqarta Fields that have the corresponding Labels, at the bottom of the main Daqarta window. If you really like the current track, you can extend the performance indefinitely by entering -1 into the Time field. Taking the "jam session" idea to extremes, suppose that instead of each voice playing an independent "song", it just plays random notes of a given scale? PhrygidBlueJam.DQM does just that, using the Blues Phrygian scale. (It also allows hot-key scale selection like GlossyFish.) Percussion is similar to that in GlossyFishSticks. It's a bit more loosely structured, but definitely listenable and sometimes superb. To keep things interesting, and more like a real jam session, the dynamics of the performance change on a random basis. Sometimes the voices play on every beat, sometimes they skip a beat or two. Sometimes the playing is notably staccato, and occasionally there is a dramatic pause. AirBand (and AirGuitar, see below) expand upon the random-note jam session concept used in PhrygidBlueJam. There, each voice used a wide (2 octave) range of random notes centered around the current random input note. Here the notes are a bit less random, only +/-2 semitones (default), but centered around different offset distances from the input for each voice. For example, by default Voice 1 is centered 6 semitones above the input note, and Voice 8 is 6 semitones below the input. The above is plain "hands-off" random-generator DaqMusiq. However, you can use hot-keys to control the note range and the center spread, and a number of other effects as well. You can shift everything up or down by octave steps, or set it to automatically shift very high notes down an octave. You can force the note range and spread to zero so that all voices play the same input note... a surprisingly cool effect. And perhaps most important, you can control the musical scale. Essentially, you are not playing the instruments, rather you are directing the performance like a band leader. However, while the hot-key effects can be interesting using the random DaqMusiq input, AirBand and AirGuitar are really intended to be used with a microphone and voice input. In that case, your voice (or whistle or other instrument) provides the Pitch Track signal. As your pitch goes up and down, the output notes follow the general trend... but always in tune and in the selected scale. You can't hit a wrong note... anything you do will become music, even spoken words or "Doo BEE Doo DAH" babbling. If you pause, the output notes pause, while the percussion continues to keep time. Other hot-keys help accomodate your input range, plus allow for ease of switching between low vocal and high whistle notes without going out of a desired range. You can easily select additional scales from the master list of over 500 named scales, or add custom scales of your own. See the full AirBand Help discussion for details. Only the melodies are used (no chords), and each is transposed to the key of C by means of its Pattern Key control. Each song starts at a random location initially, but repeats from the proper start after it reaches the end. The songs are different lengths, so they don't stay in sync. Each voice plays 40-60 beats, then changes to another random instrument. It may also randomly shift up or down by an octave. The result is surprisingly listenable, not the total chaos you might expect. The individual melodies often seem nicely interwoven, such that much of the time it can be hard to pick out a single melody. No attempt was made to find songs that would work well together... these were just the first 8 songs transcribed into Daqarta. A few of these (with chords intact) are discussed below. The following are conventional songs stored as Note, Chord, and Velocity Patterns. The Daqarta performances repeat endlessly, with variations provided by Changes scripts to maintain interest. The traditional song "Frere Jacques" (also known as "Brother John") that is often sung in "rounds". Here there are 4 different instrument voices in the rotation, with a new instrument replacing an old every 32 beats. The traditional song "Joshua Fought The Battle Of Jericho". Random instruments are used for the melody and chord voices, one of which is changed every 8 beats. Percussion (Side Stick and Acoustic snare) are toggled on or off every 64 beats. Traditional song "When The Saints Go Marching In". Random instruments and percussion toggling similar to Joshua, but here the percussion instruments are also selected at random.